Several shows being postponed until 2010 because of "sheer magnitude"
(CNN) -- Several of Michael Jackson's comeback concerts in London have been postponed until next year because producers can't be ready in time for the July debut, according to a "Dear Customer" e-mail sent to ticket holders Wednesday. 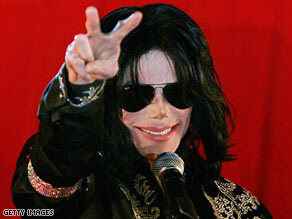 Michael Jackson gestures to the crowd at the March announcement of his series of London concerts. The delay comes days after the concert promoter said Jackson was in good health, contrary to media reports he was diagnosed with skin cancer. Jackson's "This Is It" shows were to begin July 8 at London's 20,000-capacity O2 Arena. "It was not an easy decision to change the schedule but in the end we wanted to ensure that all of Michael's fans attending the concerts get the same quality in staging and level of entertainment," said the Ticketmaster e-mail sent to someone who bought tickets for the third show. "In order to deliver a phenomenal and unprecedented show -- the first show on the 8th July will take place on 13th July 2009," according AEG Live, the promoter of the London concerts. "The subsequent shows on 10th July will be moved to 1st March 2010, 12th July will be moved to 3rd March 2010, and the show on the 14th July will be moved to 6th March 2010." The delay is "due to the sheer magnitude" of the concerts, AEG said. The decision "to move back a few of the opening shows" was needed "in order to meet the challenges presented by such a massive and technically complex show," it said. Randy Phillips, president and CEO of AEG Live, last week denied reports that Jackson had skin cancer. "He's as healthy as he can be -- no health problems whatsoever," the executive told CNN on Saturday. "Michael, who is directly involved with all aspects of the styling/choreography/band selection and rehearsals, is working around the clock to ensure this is the show to end all shows!" AEG said in it's delay announcement. Jackson held open auditions for dancers last month at the Nokia Theater in Los Angeles, California. Promoters released a video this week showing that process and ending with a clip of the 12 dancers who were chosen meeting Jackson in an undisclosed gym in the Los Angeles area, where he has been preparing for the shows. Ticketmaster, in its e-mail, assured the ticket holders they would "have the same seat originally purchased." "You do not have to do anything as you will be automatically allocated the same seats and moved to the revised date," it said.